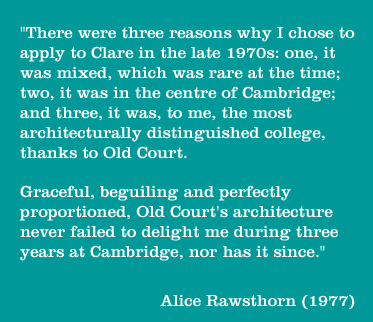 Old Court is the jewel in Clare College's crown; a beautiful Grade I listed building that embodies both our 700 year history and, for many of our members, the unique experience of student life at Clare. Founded in 1326 Clare is the second oldest College in Cambridge. Its architectural heart is the famous Old Court, a building of exceptional historical importance. Stretching over the River Cam, Clare Bridge dates back to the seventeenth century and is the oldest footbridge in Cambridge. The stunning College Gardens are also one of the College’s greatest and most admired assets. The College is responsible for the preservation of these wonderful features for the benefit of its current and future members, and for the public as a site of national significance. It costs over £1 million each year to maintain and protect the historic heart of Clare, yet we receive no statutory or heritage funding to assist with this. You can read more about the plans in an interview with the architects, on pages 6-9 of the October 2017 Clare News and by reading our campaign booklet below. If you are interested in making a donation to the project you can do so online here. If you feel you are able to make a larger commitment and would like to learn more informaiton about the recognition opportunities associated, please do be in touch with our Development Director Bill O'Hearn. You can also use this pledge form. Almost 500 years since construction began on the College as we know it, Old Court is now in need of vital restoration and refurbishment. Detailed plans for the Old Court restoration project are currently under discussion with the appointed architects, Stephen Witherford of Witherford Watson Mann and Henry Freeland of Freeland Rees Roberts, who will be working in collaboration. Our planned works will protect the fabric of the building, ensure our facilities are fit for the purposes of a Cambridge College in the 21st century (and beyond), and improve energy efficiency – overall reducing our annual running costs and environmental impact. Since Old Court is a Grade I-listed building, the craftsmanship and materials required to complete this landmark project will need to be aesthetically compatible with the original College design. For example, in order to sympathetically replace its Collyweston slate roof, we must re-open a slate quarry in Northamptonshire. The cost of replacing these materials like-for-like is a financial burden we must undertake, however it is impossible for Clare to fund this vital but costly project solely from our existing resources. To do so would mean impacting the quality and availability of College teaching and financial support for our students. We must therefore seek additional funding to make this restoration possible. As of 2019, the overall project cost is projected at £41 million. We aim to raise at least £25 million in order to undertake this project. If you decide to make a donation to support the refurbishment of Old Court, you will be helping us to turn this ambitious, once-in-a-lifetime project into a reality. All gifts, of any amount, will be very gratefully received. If you would like to find out more about the proposal, discuss the possible impact of your gift, or find out about the specific opportunities available to donors, please contact our Development Director Bill O'Hearn. You can also use this pledge form.